If you’re tired of constantly hearing news about greedy corporations cruelly exploiting their labor, here’s a rare story of a business that is truly doing right by its workers: This incredible company offers free meditation classes to its employees to give them the inner calm they need to stop stressing about their terrible health insurance. Wow! It’s refreshing to see a company finally recognize the value of self-care. For the past six months, Minneapolis-based Levitt Logistics has been generously providing regular free meditation sessions for all of its full-time employees in an effort to help them direct their focus on positive things instead of their very costly, minimally beneficial health insurance. The half-hour classes are specially designed to promote mental well-being, teaching workers practical strategies for coping with the all-consuming terror of having a high-deductible health plan that does almost nothing to offset the costs of prohibitively expensive prescription medications and that charges sky-high copays for even the most basic of preventative services. 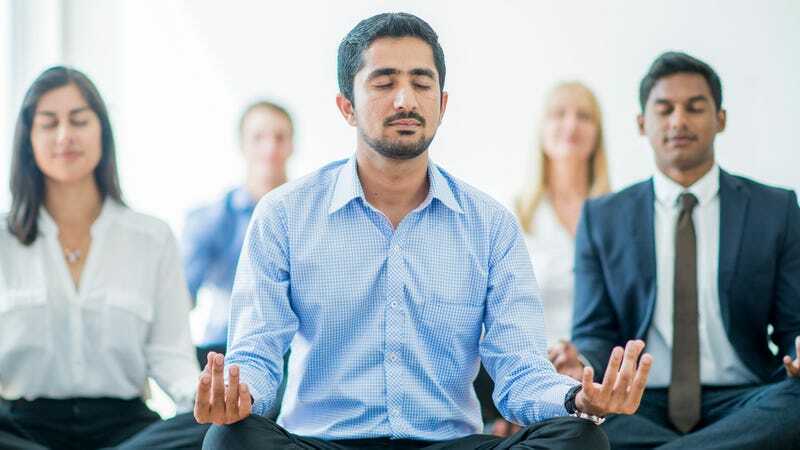 The daily 2 p.m. meditation classes have proven to be incredibly popular among the company’s staff, as they’re the closest thing most employees have to mental health care, considering their insurance provides virtually zero in-network options for therapy or psychiatric services. The success of the program proves that investing even just a small amount of resources into your employees’ well-being can go a long way toward alleviating the effects of not investing in their well-being in any substantial capacity elsewhere. Other companies with terrible health plans, take note: THIS is how you show your employees they matter. Kudos to Levitt Logistics for going above and beyond for their workers.